No, I’m not talking about a dog of a story, I’m talking about the yapping, tail wagging, love you forever kind of friend that writers should not be without. However, in deference to all my kitty-loving friends I must admit that some cats have been able to capture the same wonderful traits found in dogs. 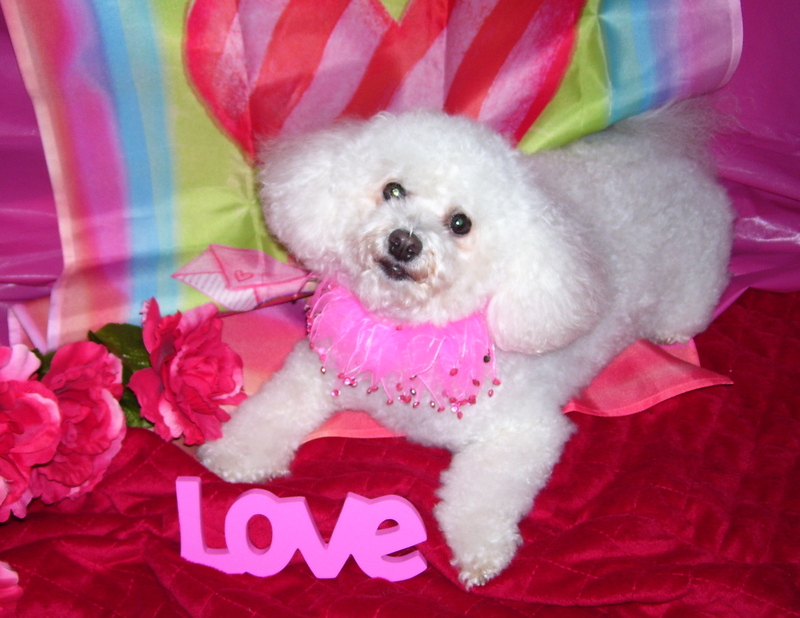 Katie is my baby…well, she’s actually a Bichon Frise, but as far as I’m concerned she’s my baby. She loves me unconditionally, pines for me when I go out and jumps for joy when I return. Okay my husband loves me, but he doesn’t miss me if I spend hours at the mall (actually he’s glad he wasn’t asked to come) nor does he jump for joy when I return. Katie is thrilled with a piece of bologna…, husband, not so thrilled. Now that you’ve got the picture, I’ll tell you the truth. Sweet adorable little Katie is a replacement dog. 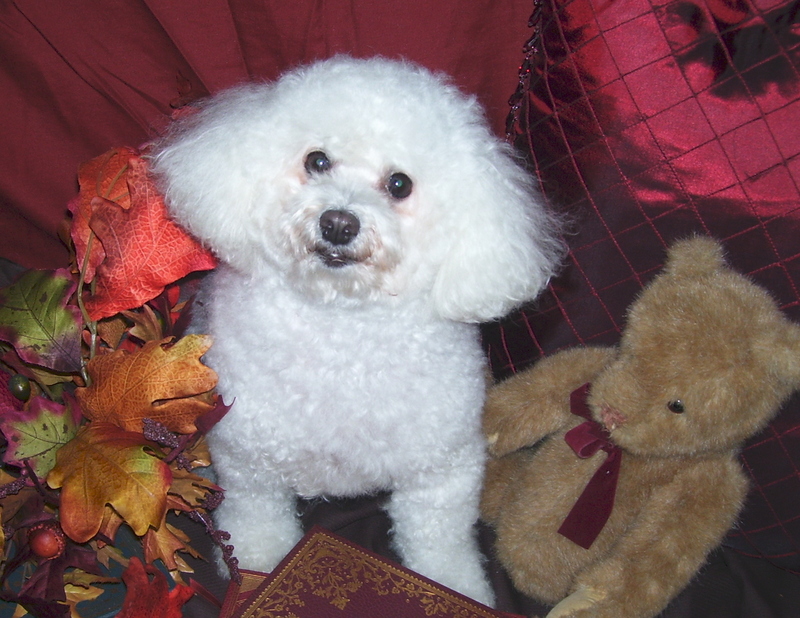 She was adopted from a rescue center after my first Bichon died at the ripe old age of 18. My first dog was Brandi, and she was every bit as loving as Katie (it’s a dog thing) After I lost her, I was heartsick, could not write and cried at the drop of a hat. I was wearing my sadness like a plastic raincoat that has no warmth and leaves no room to breathe. 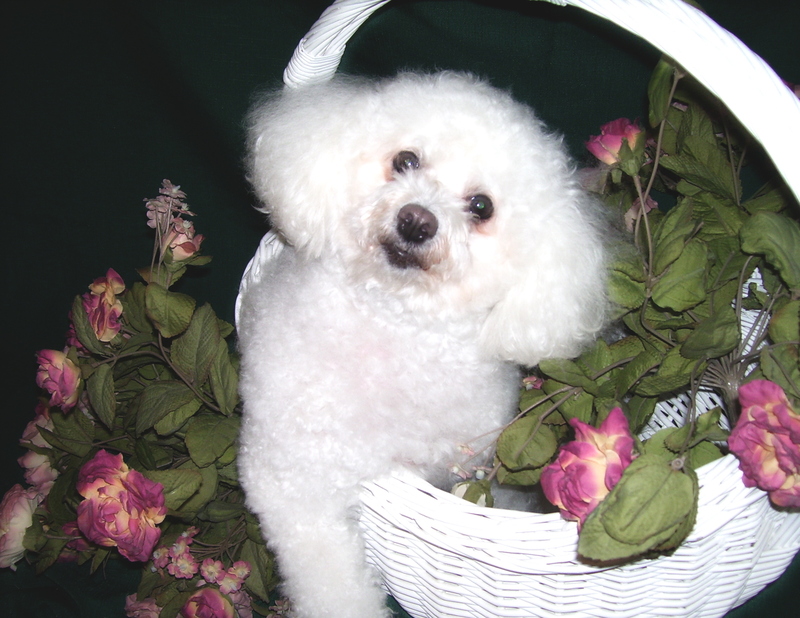 As enveloped in this sadness as I was, I simply could not bring myself to go to a breeder or pet shop and pick out a dog to replace my Brandi, yet I missed the companionship more than words (even a writer’s words) can tell. I finally wriggled out of my own sorrow and decided that if I could no longer have MY dog, I could at least give a less fortunate pooch a home. I found Katie through an internet adoption site and applied for her. Thus we became Mistress and Dog. While Brandi was fluffed, puffed and adorable, poor little Katie came to me shaved, newly fixed and looking like she’d just escaped a concentration camp …how could I not compare this scraggly creature to the adorable dog I’d just lost? But God in His wisdom gives dogs something that people sometimes lack…the ability to keep on trying to win your heart regardless of rejection. Within the week I was hers. Now I can’t imagine my life without her. Oh she’s not Brandi, and I know longer expect her to be. I love this feisty little rescue dog who of her own free will leaped into my lap as I sat at the computer, and stayed there. Quite obviously she knew more about love than I did…but I’m learning. Now Katie is as much a part of me as an arm or a leg; and I wouldn’t change her any more than she’d change me. 1) A Dog needs to pee, so you are forced to periodic breaks from the computer. 2) A Dog happily listens to that revised manuscript as many times as you want to read it. 3) On a cold afternoon a dog in your lap keeps you warmer than a space heater. 4) A Dog does not expect you to actually cook dinner…a slice of bologna or take out is fine. 5) Although you can paper your walls with rejection letters, your dog still thinks you’re better than Jodi Picoult, Anne Tyler, or Sara Gruen. 6) A dog doesn’t punch a time clock, they’ll keep you company for as long as you work. 7) A dog will join you in a lazy day nap, or stay in bed beside you if you’re sick. 9) A dog eliminates the need for a doorbell. 10) A dog will teach you what unconditional love actually is. But a word of warning…once you fall in love with a dog it is a forever thing! I know. Trust me, I know! dog like Katie to keep me warm and be there when you need extra “hugs”. I think I’m too selfish for a dog. I like to take vacations and only certain places take dogs. I don’t want to put them in a kennel because they always come back with kennel cough. I would feel like I’m imposing if I bring him to any of my children’s homes when I stay with them days and weeks at a time (presently I’m staying months at my son’s in Tampa). When we get those horrible freezing and snowy days up north, I don’t want to go out for a walk. Maybe, if I ever move to Florida, I will consider it. But I know if I had a dog, I would want it to look like your Katie. She is adorable! Dogs teach us courage by example and inspire us to be as smart and kind as they seem to think we are. Your story of Brandi and Katie touched me deeply. We also have known the grief of losing an old friend. Dogs truly are the most loyal of friends. They lick your wounds, stay by your side when all others have gone, defend you with their life and inspire you to be a better person as reflected in their eyes. To love a dog is to know that all that is good and nobel is possible. I agree with every word. My little ‘ghost writer’ Bela is sitting on my lap this very minute. Your posts are marvelous! Oh my gosh, what a great story. I loved it. You ought to follow Katie around for a month and write humerous stories about her life. I loved the top 10 reasons. In addition to all of the people you have hooked on your blog by feeding them chapter by chapter of CITS…you could hook a few more readers by letting them follow Katie’s escapades. Totally agree with all that you wrote.